I hesitate to say “I like beer” these days, but I do like it. I spotted a beer named “Sue,” and it seemed worth a try. That’s why I bought some Pseudo Sue Pale Ale for a taste test. The beer, 6.8% ABV, comes from the Toppling Goliath Brewing Co. in Decorah, Iowa, and features striking artwork, as you can see. 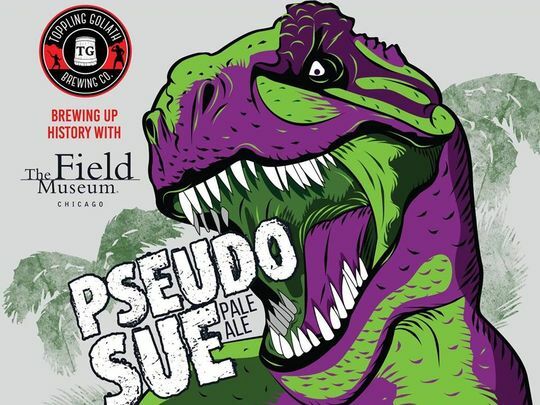 One of the brewery’s co-owners, Clark Lewey, said they named the beer in honor of Sue, the T. rex at the Field Museum in Chicago. His family visited the dinosaur’s exhibit several times when his children were young. The museum wasn’t sure it wanted a beer named after its prized, trademarked Tyrannosaurus rex, but after a heartfelt chat about the brewers’ enthusiasm for history and science, both parties worked out a cross-promotional marketing agreement. You can now buy the beer on tap at the museum’s Bistro and in four-packs of 16-ounce cans at Chicago-area stores. That’s how I got my sample to take home for a taste test. That’s close to my opinion. The hops are as sharp as dinosaur Sue’s teeth: scary big, close to the too-bitter line, almost resiny — but not quite over it. If you like hoppy beer, you’ll love this. It’s a good thing I like hops. My husband, who is sensitive to bitterness, didn’t care for it so much. I’ll buy this again, but not all the time. I might dull my palate to its roaring ferocity. Besides, sometimes the moment is right for a tamer beer, and there are lots of other fine Midwest brews to sample. P.S. I’ve decided that the T. rex is my spirit animal. Because our times call for ferocity.